In this image from last year, Pope Tawadros II (L) meets with Egyptian President Abdel Fattah al-Sisi (R) in Cairo, Egypt. Many Copts say they will support President al-Sisi in next week’s election. Parishioners attend the liturgy at Holy Family Chaldean Mission in Phoenix, Arizona. ...Mar Abraham Chaldean Church, the community’s headquarters in Arizona, was founded in 1995 by 70 Chaldean families who settled in the state. Raad Delly was among them. His uncle, Mar Emanuel III, led the Chaldean Church as patriarch and cardinal, and died in San Diego in 2014. Mr. Delly doesn’t have any grandchildren yet, but says that when he does, he will teach them their Chaldean heritage. Maha George, who sings in the choir at the Chaldean mission in Gilbert, outside Phoenix, says the same. Mrs. George left Baghdad years ago after being shot by one of Saddam Hussein’s men while she was eight months pregnant. Her husband, Luay, worked three jobs to help establish their family, which now co-owns two car washes. 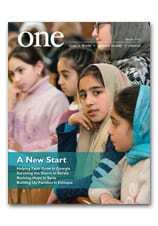 Read more in the Winter 2015 edition of ONE. A refugee and her daughter walk to their makeshift home in Bechouat, Lebanon. In Lebanon, the Franciscan Missionaries of Mary is a small congregation, with just 30 sisters. They are engaged in aiding the poor and needy — as well as helping Syrian and Iraqi refugee families. For the fifth consecutive year, through CNEWA funding the sisters run a program that aims at reaching and making a difference in the lives of displaced and refugee communities of children, youth and adults who have and still are suffering from the fallout of the wars in their countries, as well as the hard conditions they face living in Lebanon. Through their social center, the sisters — assisted by a team of psychologists and specialists provide moral, social and spiritual support by organizing retreats, trips and camps for the most affected members of the family. This helps them overcome their trauma and anxiety about their future — giving them hope. To date, more than 700 families have been screened, guided and given support by the sisters and social workers, benefiting somehow from the various programs and activities that are offered. This is the story of one such family. Mariam and Mirna are Chaldean Iraqi sisters, ages 20 and 18, who found refuge among the Lebanese community with their mother and younger sister, Mina. After being deserted by the father, they had no support system when they arrived in Lebanon. The Franciscan Missionaries, through their social work, reached out to this family and followed-up closely to help them get settled, find jobs and schools, and most importantly, help them cope with their new environment. The mother and three daughters attended various retreats and summer camp, which helped boost their spirits and sustain their faith. At the age of 18, Mariam suffered a dislocated jaw, causing difficulty with eating and speaking and also causing frequent headaches. The social workers’ intervention and the devotion of the Franciscan Missionaries of Mary gave her a chance at a normal life; following several months of research and treatment, Mariam was able to undergo surgery to fix her jaw. Mirna, to support her family, worked at a restaurant for less than a minimum wage salary, as she had no experience. The sisters guided her to pursue a learning program in food preparation and catering skills. Today, the family is settled in a small rented house in Jounieh, in the Kesrouan region; the mother works as a cashier at a grocery store, Mariam works at a bakery and Mirna still works at a restaurant — but with a much better salary. The youngest sister Mina attends the Syriac Catholic Angel of Peace School. Social workers are following up with the family. The mother and her daughters continue to attend various activities and retreats sponsored by the Franciscan Missionaries of Mary. Thanks to the sisters — and the generosity of CNEWA’s donors — these women have a new start and a new life. A young Armenian Catholic in Georgia represents the hope and promise of people who hold fast to their identity and faith. Read about their Staying Power in the Autumn 2013 edition of ONE. Syrian civil defense volunteers search for victims following Syrian government air strikes on the Eastern Ghouta rebel-held enclave of Douma, on 20 March 2018. An air strike has reportedly killed more than a dozen children sheltered in an underground school in the region.